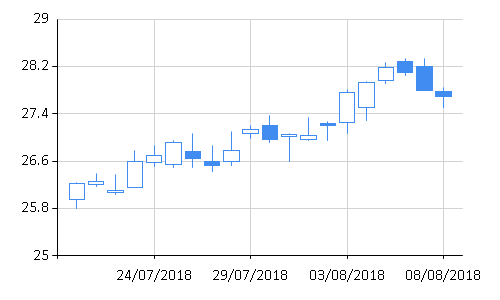 Summary: This example shows how to create stock and candlestick charts to visualize financial data in F#. It looks at how to draw charts, use dates as labels, and specify the range of a chart. A stock or a candlestick chart can be created using the FSharpChart.Stock and FSharpChart.Candlestick methods. Financial charts for visualizing stocks require four values for drawing each data point (High, Low, Open, and Close price). When calling the methods, it is possible to specify the values as a collection containing four-element tuples, or five-element tuples (Date, High, Low, Open, and Close price). The first snippet calls the Chart.Stock method with a list containing prices as four-element tuples. The second example adds dates as the labels for the chart. This is done using the List.mapi function. The lambda function used as an argument returns a tuple containing the date and the original tuple of prices. 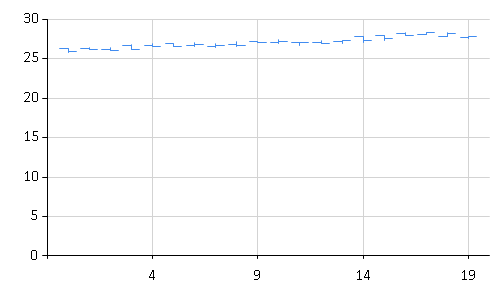 The example also demonstrates how to set the price range of the Y axis using the method WithYAxis. The last example shows an elegant way of configuring the Y axis range by using pipelining (the |> operator). The chart specification is passed to a configuration method Chart.WithYAxis using pipelining. This method takes named parameters that allow us to specify the range and other properties of the axis.